A few months ago I posted about the first series of S.L.U.G. 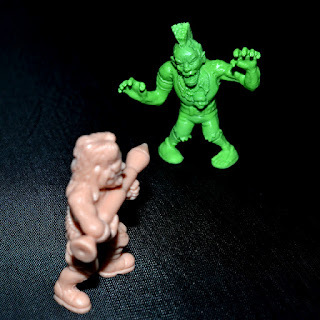 Zombies, a new line of zombie-themed mini figures from JAKKS Pacific. Now I'm revisiting the line here because another outbreak of zombies has hit. Series 2 has arrived! 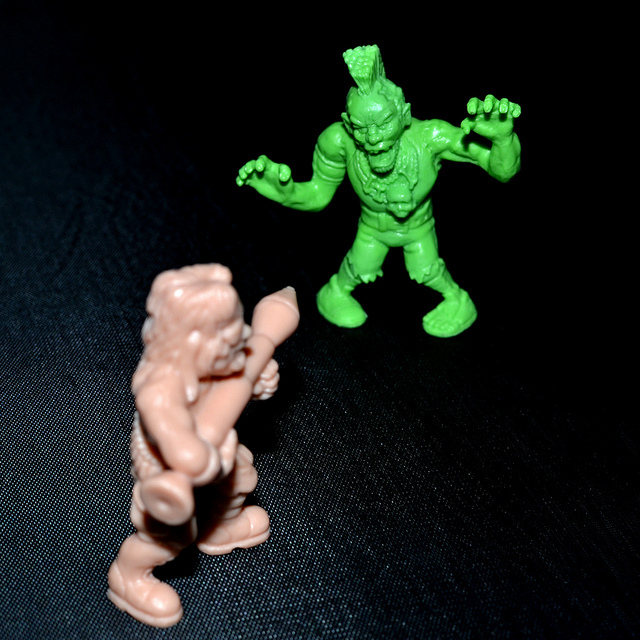 As with series 1, each figure in the new set is a zombie version of a certain character or type of person. For example, this time there's a basketball player, a tennis player, a chef (complete with a severed foot sticking out of his soup pot), and even not-so-subtle zombie takes on famous people like Mr. T and Macho Man. 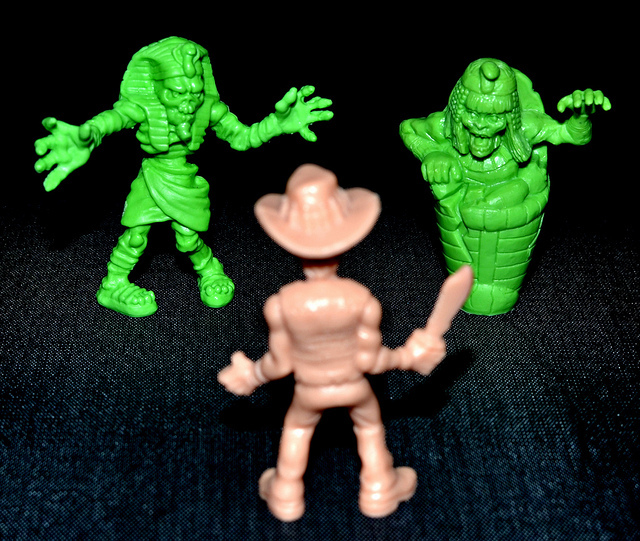 My personal favorite, though, is a zombiefied Cleopatra breaking out of her sarcophagus--it's a really rad looking figure, and a perfect companion to the series one "King Guts" pharaoh-zombie! One important thing to note about series 2 is the introduction of flesh-colored human characters included to fight the zombies. While the zombies will always be cooler just for the fact that they're zombies, the human figures are really pretty great and add more fun and variety to the line. To my knowledge, the 16 new figures haven't been spotted in physical stores yet, but pre-orders through the Entertainment Earth website have begun shipping (that's how I got mine). That is the one frustrating thing about this line so far: the fact that it's simply not available enough; the first series was found only at select Toys R Us and Walgreens stores, and while JAKKS has indicated that Target and K Mart would be carrying them, I have seen no reports of anyone actually finding them there yet. I really hope these toys see widespread distribution in stores soon because it would be a shame to see something so cool just fizzle out and die. Keep 'em coming, JAKKS, and get 'em in the stores! Mash-Up Mike (Mr. T), Stu B. You (chef), Andrew Agony (tennis player), Cleopatra Commin'atcha, Dr. Outbreak (scientist), Jump-Shot Rot (basketball player), Macho Mangler (Macho Man/wrestler), Maximus Cadaverous (Roman gladiator), Teddy Terror (some sort of old fashioned hobo, or maybe Curly from The Three Stooges), Grim Trekker (explorer), and the two humans, Gator Jones and Captain Payback. 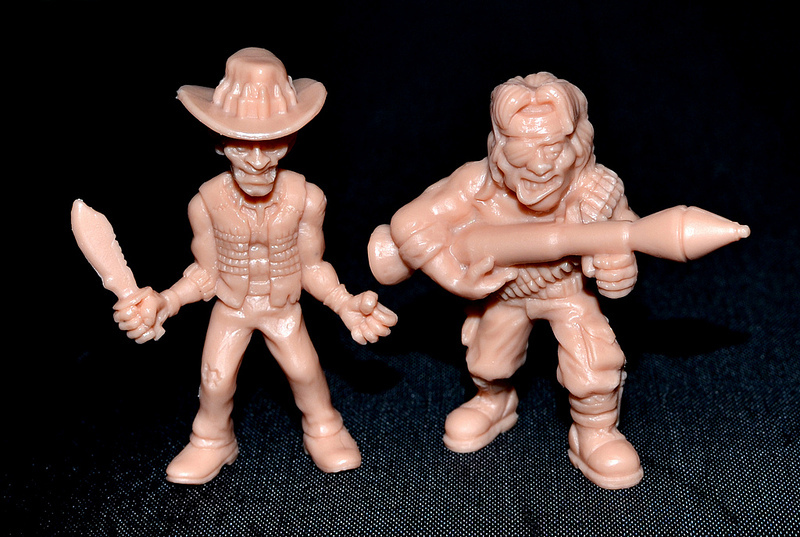 Mr. Jangles (chimp), Flesh-Eatin' Phil (zombie in a mailbox), Blazin' Basel (human), Buck Wilde (human). Check out more SLUG Zombies pics in my Flickr set.